Guys. I know I am basically a broken record around this time every year, but this winter feels particularly brutal. I don’t know if it’s the unpredictable and discombobulating weather changes (it’s a crapshoot between full blizzard or foot deep slush puddles every other week), the endless run of grey, overcast days or just the simple fact that I am single for the first winter in many winters, but I have been struggling. Whether it’s a Vitamin D deficiency or just a mild case of the winter blues, I am doing everything in my power to get through this trying season with my head up, and that involves liberal and generous doses of self-care. And in my mind, winter self-care revolves almost exclusively around the twin concepts of “warm” and “cozy”. My weekends and evenings are mostly spent at home wrapped in various heated blankets, in a non-stop puppy cuddle puddle with the occasional bath or home cooked comfort meal thrown in for variety. 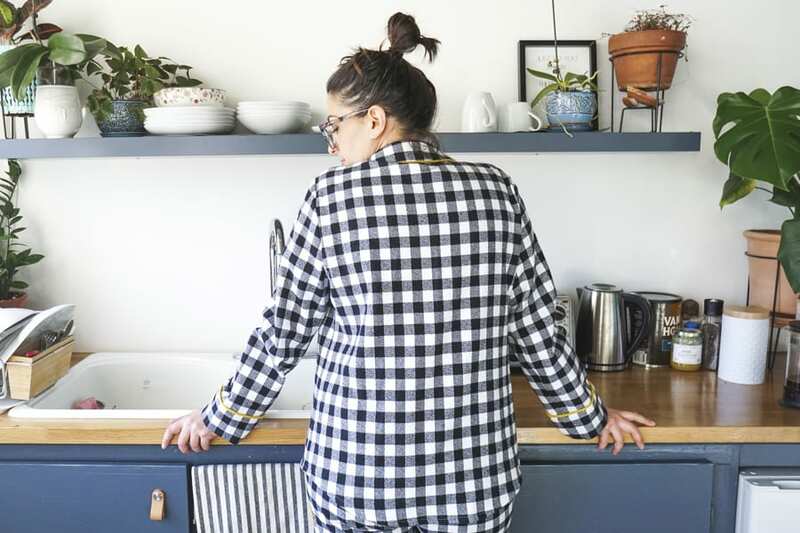 Flannel plays a very big role in this self-imposed hygge lifestyle; I sleep in flannel sheets and wear it whenever possible. Those soft, cozy fibers are like a little hug when facing another bitterly cold dog walk feels as impossible as climbing the Himalayas. 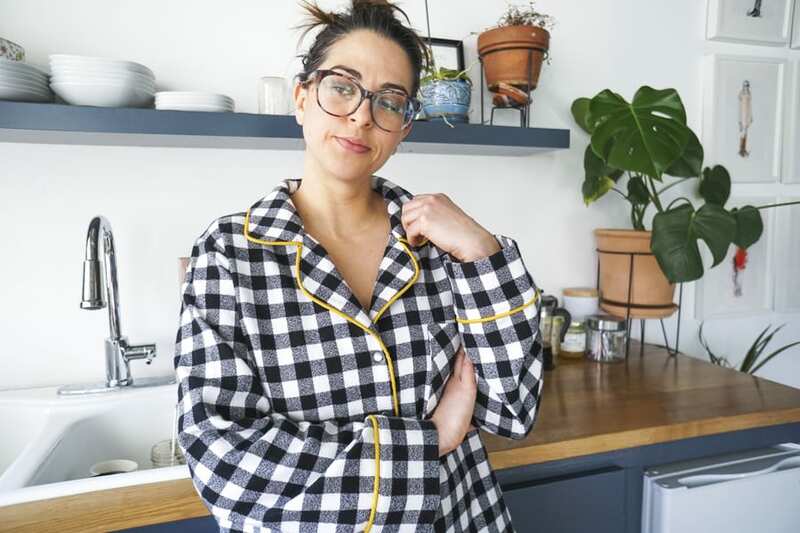 Most of my flannel Carolyn pajamas have seen better days (this poor pair is practically threadbare), so I decided it was imperative to make a new pair in the thickest, coziest flannel I could get my hands on. Naturally, I turned to Mammoth flannel from Robert Kaufman. 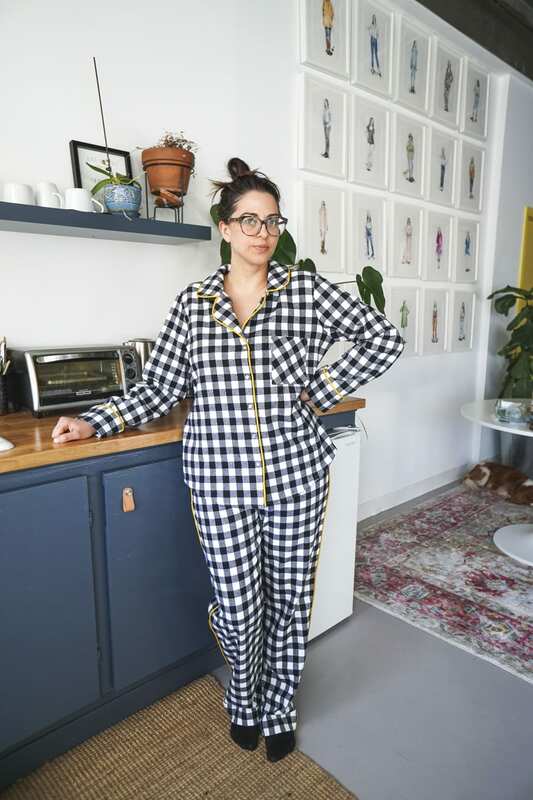 I’ve been wanting to make pjs with this stuff every since making a super warm Archer with it a few years ago (I just now realized I never blogged that shirt, which is too bad since I wear it allllll the time) and it was basically the best decision I’ve ever made. 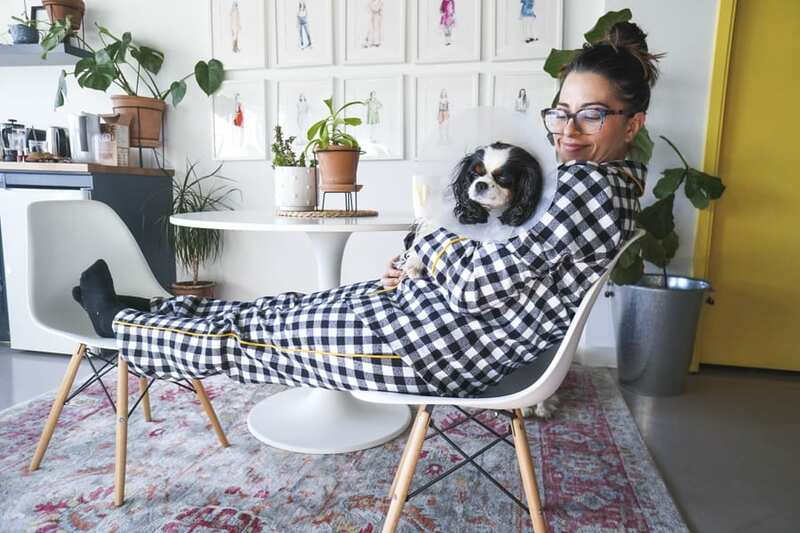 A cute pair of pajamas makes even the hardest winter feel more bearable. 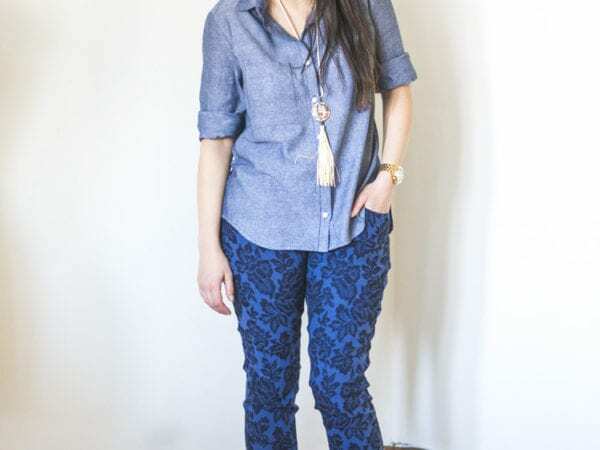 I’m not sure what’s more hilarious: this fabric/piping combo or the fact that I am posing in pajamas at the office. The things I do for you guys. 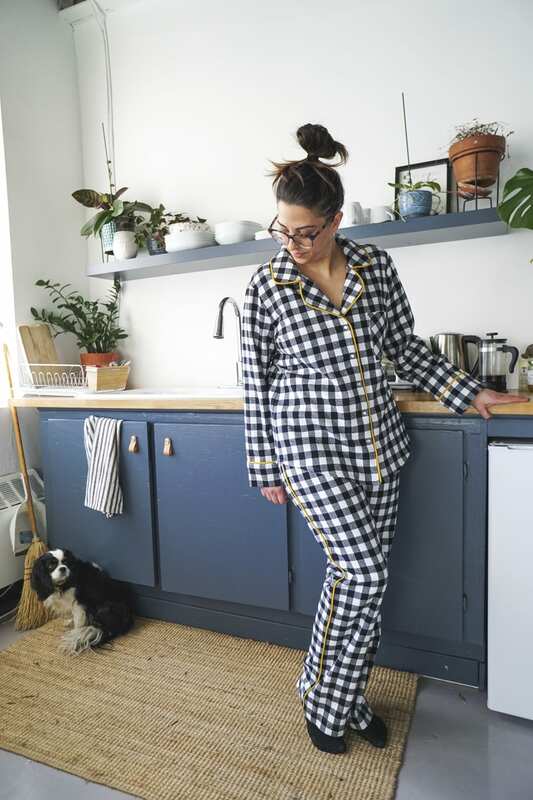 Anyway, these jam jams are the JAM. 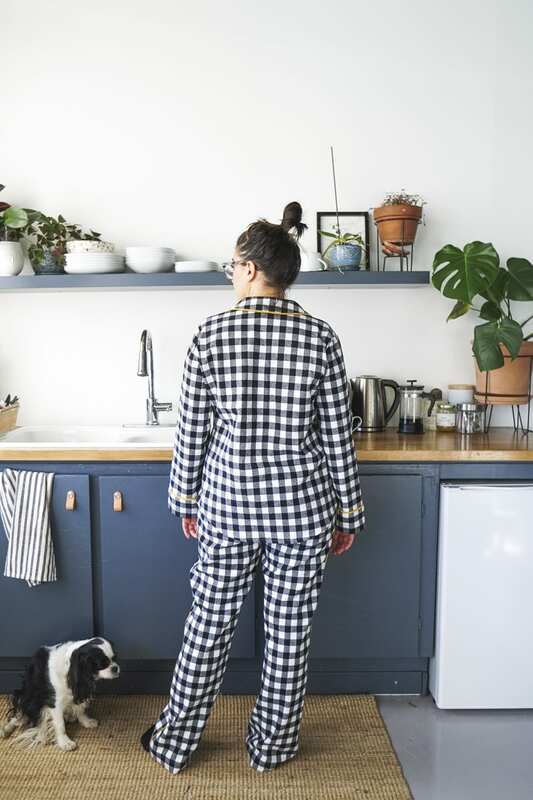 Mammoth flannel is super beefy and thick so these are essentially cozy to the power of two, and I love the buffalo check print. I spent way too much time deliberating about what print to go with, but I like the scale of this guy. Robert Kaufman kindly sent this particular fabric to us, but you can also find it in stock here. 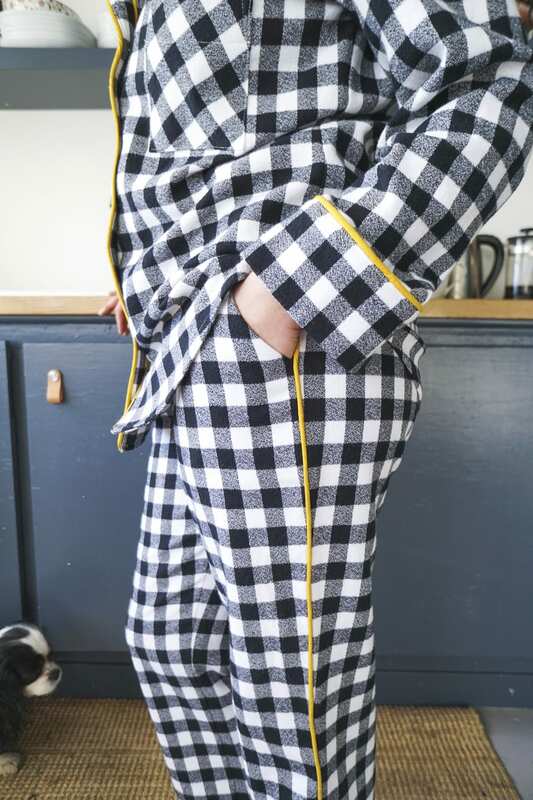 As for the piping, I’m going through a serious yellow phase at the moment and made it using our piping tutorial and this quilting cotton from Harts Fabric. The only change I made to the pattern was to install the piping running down the leg rather than around the cuff. You know, like tuxedo pajamas. I also skipped buttons in lieu of pearl snaps, mostly because I didn’t have any buttons in the stash I wanted to use. If my single status ever changes, I foresee a very hilarious tearaway reveal sometime in my future. I’m also happy to report I made these at home. My little sewing corner has been seeing a lot more action since I reorganized it, and I’ve been trying to sneak in sewing sessions a few times a week. It’s easy to fall in the binge-watching hole when you’re in the winter doldrums but I’ve noticed I feel less guilty about rewatching all of the Gilmore Girls (again) when it’s on my ipad next to my sewing machine. I think I’ve done more recreational sewing in the past few months than I did in the entire previous year simply because it’s more functional and permanent than it was on my dining table. Needless to say, these pajamas have been in near constant rotation. 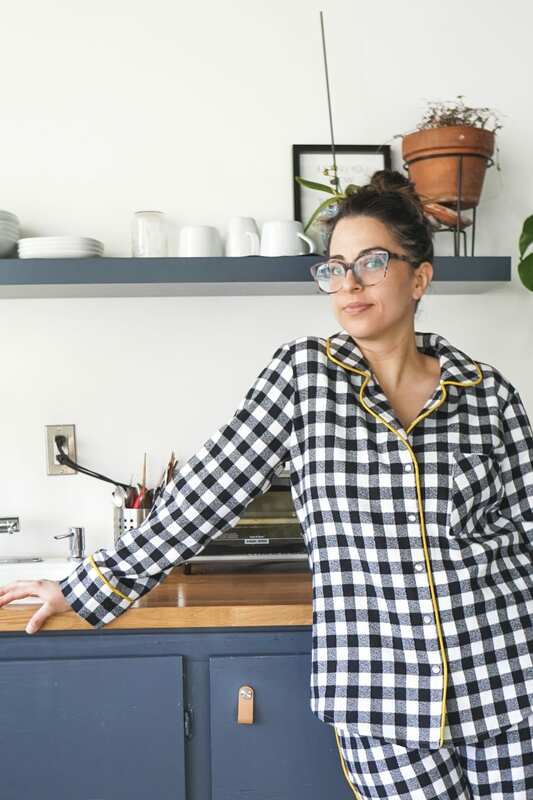 They even kept me warm on an icy morning walk this weekend – the power of mammoth flannel is mighty (yes I wore my pajamas outside, no I will not apologize). So… how are you surviving this winter? And what’s the best outfit to do it in?